A classification algorithm for the automatic analysis of ultrasonic impulse echo signals received from carbonfibre reinforced plastics (CFRP) in aeronautical applications is presented in this paper. It is based on a learning classifier and can be used for flaw detection as well as for material characterization. The real progress of this algorithm is that it allows a fully automatic material evaluation. Lightweight advanced materials gain an increasing importance for aeronautical applications and beyond. Carbon fibre reinforced plastics (CFRP) will replace conventional aluminium structures for different purposes. Today, stabilizers and flaps of some aircraft are made of CFRP. Many more parts will be manufactured of composites in the future, even in security relevant functions. In general, the use of CFRP requires a reliable nondestructive testing technique for the determination of material properties and flaws. Currently, a human inspector visually evaluates compressed data acquired by an ultrasonic testing unit. This implies a massive data reduction from the threedimensional ultrasound signal available after impulse-echo-scanning to a twodimensional image for evaluation. The detailed information inside the ultrasonic signal is in this case not any longer available for interpretation. To overcome this limitation, an automatic algorithm for classification of threedimensional impulse-echo-signals is presented in this paper. The proposed system focuses on the detection of two main flaws of fibre-reinforced materials, delaminations and porosity. Delaminations are areas of disbonding of adjacent material layers leading to an interruption of stress transfer and thus a decreased stability. Pores are minor gas inclusions in one or several depth layers. An increased volume fraction of porosity also reduces the composites stability. The ultrasonic testing of CFRP materials differs from the inspection of conventional metal due to the composite structure. As a result of the inhomogeneous and layered material, the ultrasound signal is backscattered from internal boundaries throughout the composite. Additionally, CFRP are often used as a cover layer for honeycomb structures. In this case, no legible back wall echo exists, such that the material evaluation has to be based upon the analysis of the complete backscatter signal. The purpose of the presented algorithm is to examine the backscattered ultrasound signal from within the material and distinguish normal backscatter, delamination signals and porosity indications. Many different means of classification techniques are known for several applications. Some are based upon neural network techniques trying to reconstruct a natural brains structure; some are based upon statistical decision theory. The main objective of a classifier is to compute a class membership for a given vector of signal features, see Figure 1. The classifiers result is thus limited to a set of predefined classes. Fig 1: General Classification System. For all classifiers, the application can be split into learning and classification phase. During the learning phase, the classifier is offered a set of characteristic feature vectors with known class memberships. During the classification phase, class memberships are determined for each presented feature vector. In this paper, a polynomial classifier is used for the considered application. It calculates the class membership values based upon a linear combination of polynomial terms of the features. The theory of polynomial classifiers is described in . Their application is explained here first for the classification phase and then for the learning process. e. g. y = ( 0 0 1 0 0 0)T for y representing class number w = 3 of totally six. Adaptation of the polynomial classifier coefficients occurs by properly calculating the decision matrix A. Additionally, the polynomial representation terms xi having the greatest impact on the decision are selected; redundant terms are omitted to reduce the computational complexity. During the learning phase a set of labelled representative feature vectors v is presented to the classifier together with the class membership information w. The polynomial representation x(v) and the classification target vector y(w) are determined from them. The condition for having an optimal classifier is a Minimum Mean Square Error (MMSE) criterion. Thus it is sufficient to calculate the correlation matrices Rxx and Rxy during the learning process. The decision matrix A is determined from them. Calculating the matrix A, the influence of the polynomial terms xi is evaluated and terms having only a minor impact on the decision are eliminated. This selection occurs with regard to achieving the best discriminative properties; which does not necessarily imply that the selected features have best descriptive properties of the feature vectors. It can be recognized that, due to the expectation value matrix calculation, all learning feature vectors count equally independent of the order in which they are applied. Moreover,for a constant learning set, the classifier always converges to the same decision matrix. Before feeding the feature vectors into the polynomial classifier, a Karhunen Loeve Transform is applied to decorrelate the feature vectors and to decrease the number of feature terms. The transform uses an orthonormal base determined adaptively for the feature vector set. The calculation of the transformed feature vectors is based on linear combination of the input feature terms. The definition of the transform is given in . The reduction of the feature vectors dimension is possible by limiting the accepted base vectors to those most significant for the feature vector description. The significance of each base vector is determined during the transform base calculation. However, the selection of transform base vectors occurs from the point of best reconstruction properties. The discriminative properties are not taken into account for this selection. Reducing the feature dimension allows higher order polynomial classifiers (e.g. of maximal degree two) to be used even with larger feature sets. An example of the decorrelation by the Karhunen Loeve transform for a two-dimensional feature set is shown in Figure 2. Fig 2: Scatter Plot of Karhunen Loeve Transform Result. The proposed algorithm examines the backscattered echo from inside the composite. The same algorithm can be used with different settings for two purposes, determination of delaminations and estimation of porosity. An overview of the algorithm is depicted in Figure 3. Fig 3: An overview of the system. For the detection of delaminations, two steps are applied. Each has the objective to detect all flaw signals in the echo sequence while reducing the number of detected backscatter peaks. The first step is a peak detection algorithm determining all possibly relevant echo peaks. The peak detection is based upon a calculated reference amplitude. The second step is the classification of the detected echo peaks. For each detected peak, a set of features is calculated based upon the ultrasonic signals in a local environment both in time and spatial domain. The feature set is used as input for the polynomial classifier. In porosity characterization mode, the system is used as an MMSE estimator for the material property. In this case, features are calculated from a fixed depth layer echo. The system is trained to directly compute an estimate of the porosity volume fraction from the ultrasound echo data. The first step of the classification of delaminations is the detection of peaks in the ultrasound echo signal surrounded by a homogeneous background signal. The peak detection is based upon two supplementary criteria, an adaptively determined amplitude threshold and a maximum-criterion. The threshold is computed based on an adaptively calculated reference value. The reference value represents the expected echo amplitude in the case of flaw-free material. Since the expected scatter amplitude may vary, e.g. due to imperfect depth-amplitude-compensation, the reference value depends on the time-of-flight variable. Additionally, it has to be taken into consideration that occurring flaw peaks in the signal must not increase the reference value. The determination of adaptive thresholds is well known from radar signal processing and is explained in . An application for ultrasound signals is described in . Where k describes the time index currently evaluated and being the time length. However, this method does not take possible masking effects due to the existence of flaw peaks into account. Therefore two enhanced methods are proposed. This method does require an initial estimation for rCARS(0) as a starting point. To enlarge the underlying data basis, it is useful to include more than the data of a single Ascan and calculate the reference value twodimensionally, in time domain and in spatial domain. The method described here uses the ultrasound echo data of a complete scanning row (B scan) to compute the reference value for this B scan. For calculation of a twodimensional reference value, it is advisable to split the algorithm into two parts to reduce the required effort. For the cell averaging based algorithms, a separate cell averaging filter is calculated in spatial domain before applying the described method in time domain. Also the ordered statistic is determined by calculating the rank order filter first in spatial and then in time domain. Figure 4 compares the threshold techniques based upon a reference value calculation. The thresholds are normalized such that their mean amplitude in the flawfree area is identical. It is obvious that the ordered statistic and the recursive select method yield a reduced increase of the threshold at the peak occurrence. Besides exceeding the threshold, the detected peaks also have to fulfil the requirement of being the local maximum within a specified signal segment. This criterion eliminates values exceeding the threshold but having even larger values in their environment. It further reduces the number of detected events to be included into the classification process. All peaks fulfilling both the threshold criterion and the maximum criterion are considered to need further investigation. These peaks are included into the classification process. The techniques of classification have been described in Chapter 2. In this section, their use for the characterization of ultrasonic echo peaks is explained. The application of the classifier is split into learning and classification phase. First, the classifier has to be nonrecurringly trained with features calculated from the echo peaks. In the learning phase, ultrasonic echo signals with known meaning are used. For each material sample used in the learning process, a digital three-dimensional map is generated representing the apriori knowledge of the target classes. For the learning data, the described peak detection method is applied to receive the peaks relevant for classification. A set of features is calculated for every detected peak. In a first iteration, the Karhunen Loeve transform is trained by determining the transform base and selecting the most descriptive base vectors. In a second iteration, the statistical classifier is trained. For every detected peak, a vector v of features is calculated. This vector is transformed by the Karhunen Loeve transform yielding a decorrelation and dimension reduction. The transformed feature vector w is used as input for the polynomial classifier. From w, a vector x of polynomial terms is calculated. Additionally, the knowledge of the digital map is used to determine the classification target vector y. During the learning phase, the correlation matrices Rxx and Rxy are determined. The learning process is concluded by the selection of terms of x having the best discriminative properties and by the computation of the classifier matrix A. After the adoption, the classifier can be used on real data. Its operation can mainly be described by two matrix multiplications, of the Karhunen Loeve transform and of the polynomial classifier. The result is an estimate for the class membership probability vector. It is nonlinearly dependant on the feature vector, since the construction of the classifiers polynomial vector is nonlinear. The class in the membership vector estimate having the highest calculated probability is selected as the result class. The classification result can be incorporated into a threedimensional digital map for visual presentation. Additionally, the result can be compared with an apriori knowledge to test the performance of the classifier. The methods described to perform the classification of echoes detected in the ultrasound signal can also be used to characterize the CFRP material from its backscatter echo, e.g. to examine the porosity. Porosity estimation differs from the peak classification described in the previous section in the point that, instead of a peak and its environment, the backscatter echo from a fixed depth region is used for estimation of material properties. With this single target value, the system is used as an MMSE estimator for the described material property. The algorithm proposed in this paper has been applied on test data of different kinds of impulseecho ultrasonic testing devices. In this section, some results are presented. In Figure 5 the classification result of the flaw detection mode is presented. 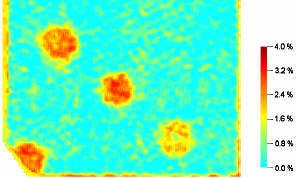 Figure 5(a) gives the C and Bscan representation of the echo ultrasound raw data of 80 mm thick CFRP material. Besides the flaws, mostly delaminations of 6 mm diameter, the sample contains a material echo layer not representing a flaw, which has to be distinguished from the flaw echoes. Figure 5(b) depicts all detected peaks after the first algorithm step as C and Bscan projection of a threedimensional map of the classification results. It becomes obvious, that still the largest number of peaks represents noise/scatter peaks. Due to the maximum criterion, an area close to the material echo layer is free of noise peaks. Figure 5(c) represents the classification result; the output is limited to the detected flaws. Fig 5: Classification result for a CFRP Sample. The estimation result of a porous CFRP sample is shown in Figure 6. The material sample used has a thickness of 7 mm and contains four regions with known pore volume fraction of 2.2 to 2.8 per cent. The image shows the determined amount of porosity. The estimation was computed based upon the ultrasound echo of a constant depth layer back scatter. Fig 6: Porosity Estimation Result. This paper has presented an algorithm for automatic analysis of ultrasound impulse-echo signals by the means of classification and estimation techniques. For flaw evaluation, a method for detection of possibly relevant ultrasound echoes by an adaptively computed threshold is proposed. The detected echoes are evaluated by a classification system. For material characterization, the system is used to directly estimate material properties, such as porosity, from the given features. First results give an impression of the methods capabilities compared to the analysis by a human inspector. This work is funded by the German Federal Ministry of Education and Research (BMBF) in the framework of the MaTech Project  New Materials for Key Technologies of the 21st Century  grant 03N3082D. The authors would like to thank the project partners, Airbus Deutschland GmbH, Bremen, Dr. Hillger, Braunschweig, and intelligeNDT Systems and Services, Erlangen, for their cooperation and the provided ultrasonic sample signals.